You want bats in your belfry. 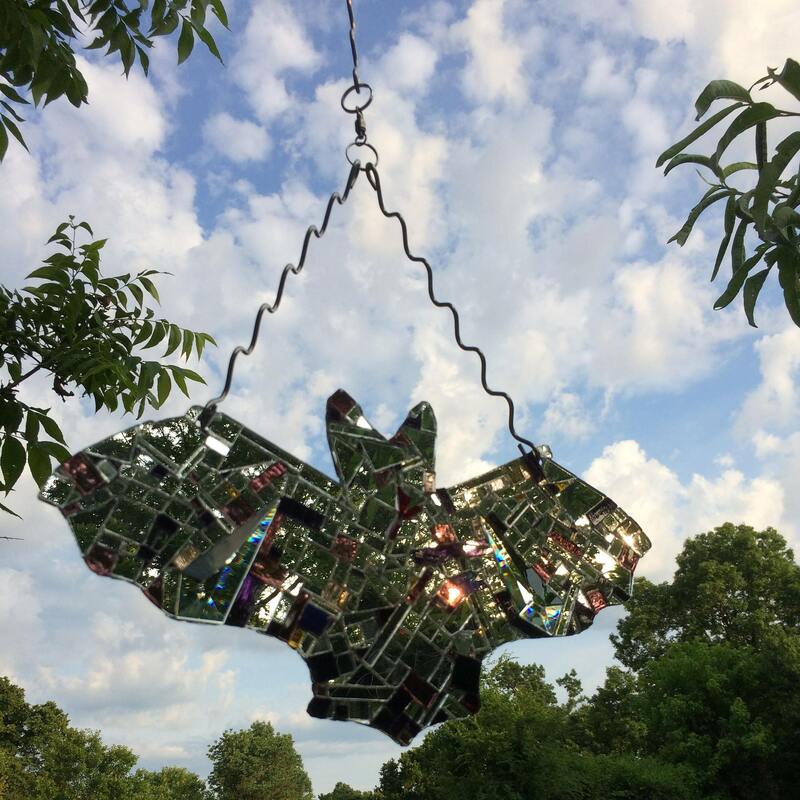 They're symbols of auspicious chi and impending wealth, and if ever a good omen is made fabulous, this bat is it. 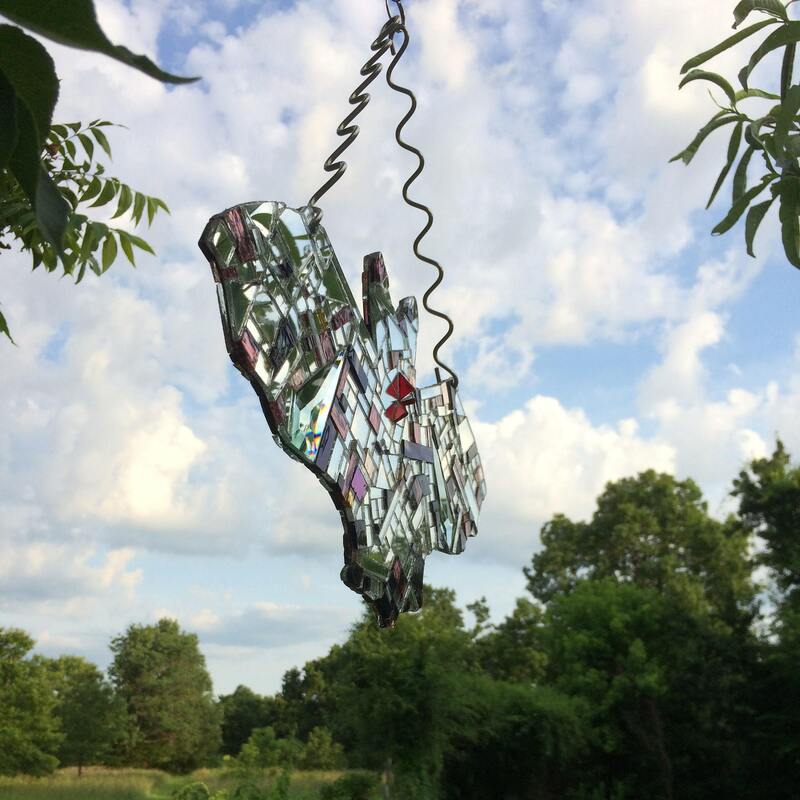 Our stout steel bat is meticulously covered in silver, purple, lavender and pink mirrors. The chi is audacious, honey. And there's no waiting for gold, we've got bits sprinkled across both wings. Rainbows! You gotta have rainbows! Four beautiful prisms, two on each side, ensure rainbows every day. Little red fangs and heart sparkle on one side. 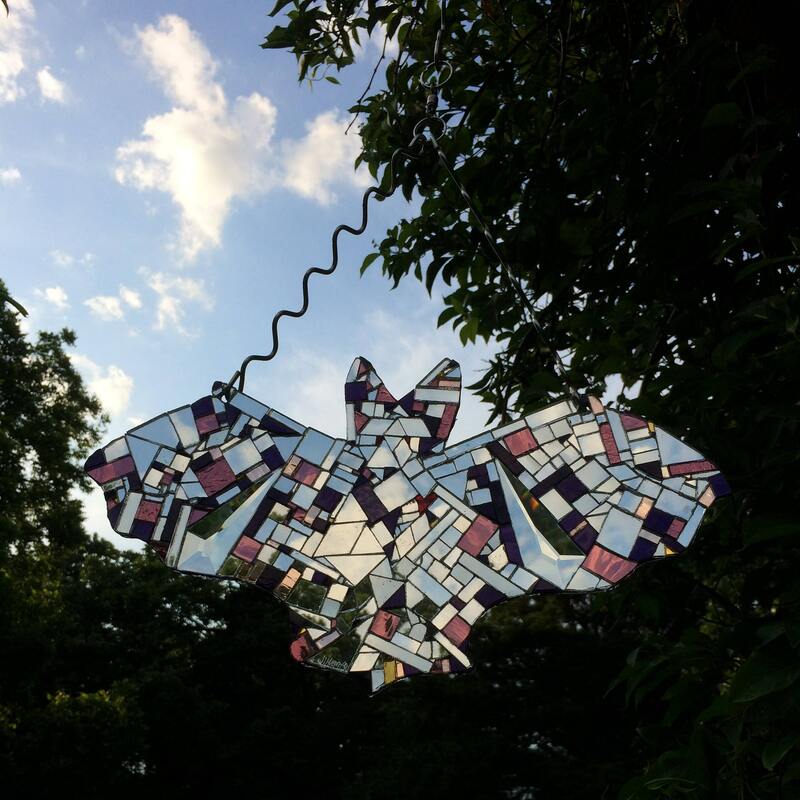 Red stained glass set to glow warmly pays tribute to the strong bat heart on the other side. Plus there's the whole spooky Halloween thing, and the insect-eating nature of these marvelous creatures. Is it any wonder we luv bats. Hang it inside or outside. Light + movement (breeze or finger tap) insure maximum dazzle. Of course this bat is gorgeous at night! Struck by moonlight, car light, lamplight, it will flash like paparazzi. 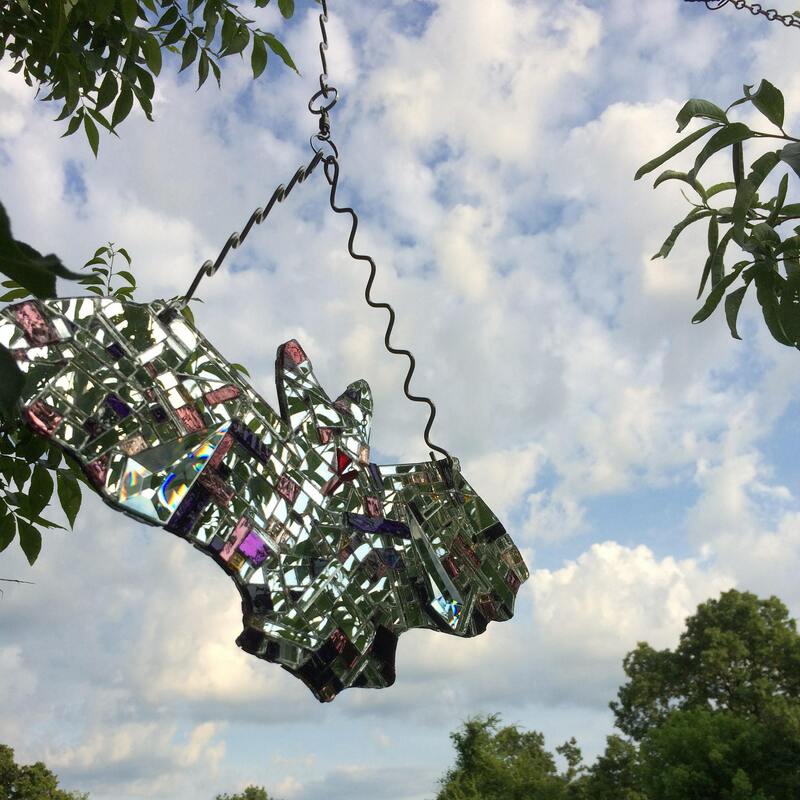 The heart of the mirrored bat is steel. 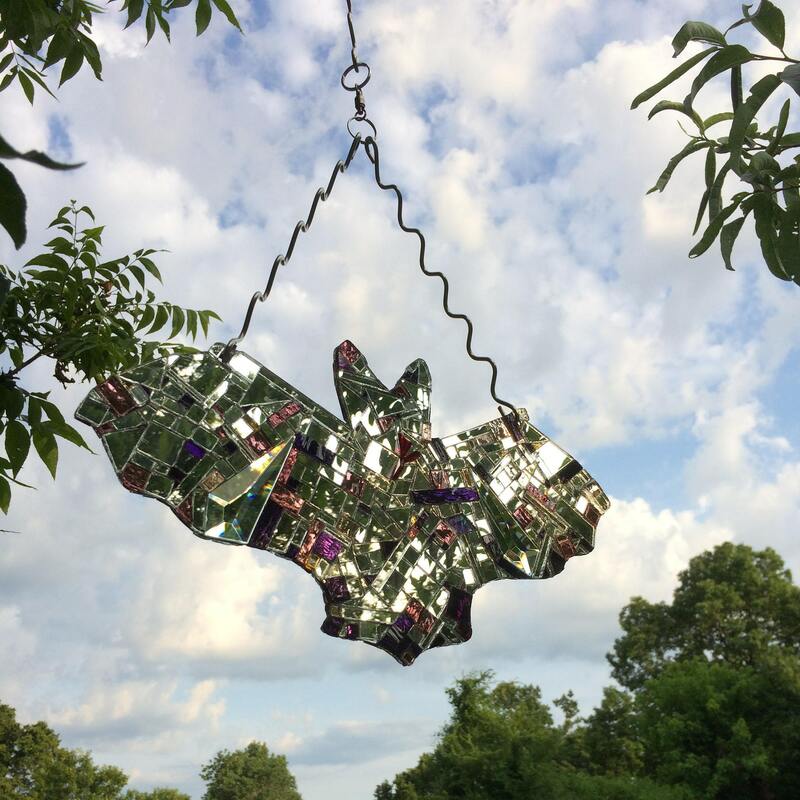 The bat hangs from a pair of 9" hand-made stainless steel squiggly hooks. From the stainless steel hanging split ring to the bottom of the bat, it's about 17". The bat turns on a 260-pound capacity ball bearing swivel. The mirror bits are snug cheek by jowl every which way and held strong with a super uv-resistant adhesive. The asymmetrical geometry is gorgeous beyond words. Domestic shipping included in price. If this bat is a gift, let me know at checkout. I'll include a hand-painted post-consumer kraft gift bag with sturdy handles and a few mirror sprinkles, and some post-consumer tissue. No extra charge. You'll be all set.